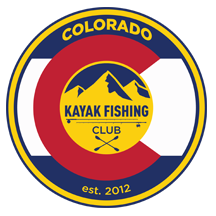 It is the mission of the Colorado Kayak Fishing Club (CKFC) to promote and inspire fishing education and conservation in a friendly community environment. Colorado Kayak Fishing Club is a volunteer run, non-profit 501(c)7 organization. We started as a small group of friends with a common interest: Kayak fishing. It went from a google group to a facebook group and grew extremely quickly to where we are today. A big Facebook family that helps promote our sport, share ideas, help our community, and foster good healthy friendships. make money, which in turn would be donated to a local charity each year!